Nothing spoils an amazingly cute outfit like an ugly bib. I know, I know, I hear you saying ‘it’s just a bib’, but Beep Beep have created bibs that are so gorgeous they’ll have you all calling lunchtime early! We have made mention of Beep Beep before with their stunning slings so we’re not at all surprised by the quality and elegant style of their new bibs. Elegant might not be what you expect when referring to bibs, but one look at these two gorgeous fabrics and you’ll see what I mean. 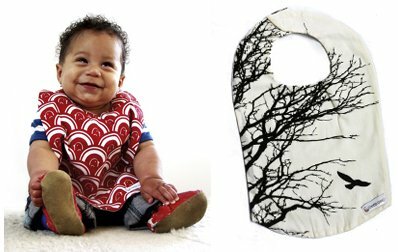 Designed, printed and made here in Australia, the black and white of the Elm tree bib fabric is beautiful as is the bold red Nami bib with its fun scallop and teeny bird design. Not only are these Beep Beep bibs easy on the eye, they’re also easy on care-givers with no fancy fasteners or fiddly bits. A simple Velcro closure behind the neck is as hard as it gets. There’s no crunchy, cold plastic fabric either as each bib is made with 100 per cent cotton and backed with snug flannel, perfect for eating lunch in comfort as well as style! You can get your Beep Beep bibs for $24 each from Beep Beep Slings with free postage to all Australian addresses!